The 991BJS round bale wrapper is a single lever servo joystick machine. 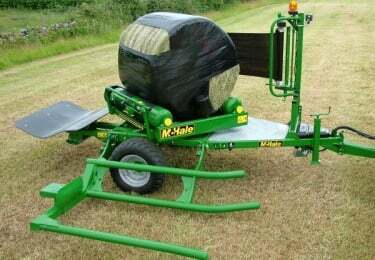 A single lever servo joystick provides accurate control and ease of bale wrapper operation from the tractor seat. The servo system on the 991BJS round bale wrapper uses low-pressure hydraulics, which gives a similar feel to the joystick used in telescopic loaders. This system gives a smooth transition between functions and is often favoured by high-end round bale wrapper users. The round bale wrapping table on the 991BJS round bale wrapper is constructed of four heavy-duty belts, which ensure smooth and even bale rotation even when dealing with loose or asymmetric bales. A smooth wrapping seal is guaranteed as the machine delivers a 50% overlap. Shear bolt protection ensures that asymmetric shaped bales do not damage the machines gearbox or drive line. On the 991BJS joystick round bale wrapper the cut and hold releases the plastic after two rotations of the bale wrapping table. On the 991BJS round bale wrapper the wizard control console monitors round bale wrapper operation. The operator can set the number of layers to be applied and can monitor the revolutions per minute of the bale wrapping table. The wizard control console also allows the operator to store two job totals. it allows the round bale to hold their shape better.